Over the past couple of days I have received some e-mails asking how much space is needed to do the P90X workout. This is a good question. When people think about working out at home they usually think about big home gyms that lay around taking up a bunch of space and sit around as an eye sore for years. The good thing about P90X is you really don’t need that much space. Here is a photo of the small area I do P90X in. You can also see I have everything you need to do P90X with. Its not the greatest place to workout but it works for me. A lot of the workouts done with P90X don’t involve a lot of moving around anyways. Plyometrics is the only workout I do not do in that area but its not to say that I couldn’t. Its just that the ceilings here are about 8 feet tall and I would be touching them every time I jumped. 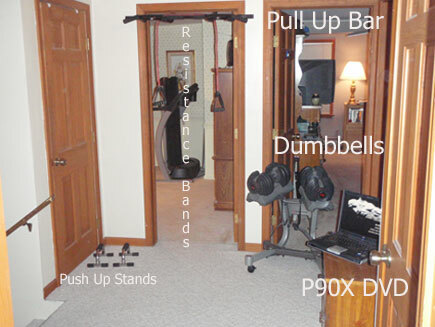 I keep all of my workout equipment like the pull up bar, resistance bands, dumbbells, push up stands, and P90X DVDs in my room. They take up very little space. The Bowflex Selecttech Dumbbells are on a stand which makes them easy to roll around but I usually just walk over to the weight rack in between exercises to get a new weight without having to stop the DVD. I use my laptop to play the DVDs so I am not stuck to one area of the house on a TV. So don’t feel like you need a lot of space to do P90X with. As you can see from my “home gym” you can get by with a small amount of area. If you live in an apartment, have small rooms in your house, or a college kid living in a dorm I am sure you can find the space available to do the P90X workout. Hopefully this photo will put you at ease if you were going to buy P90X but were concerned about it taking up a lot of floor space. Its not that much at all. Even better is that it takes me about 1 minute to set everything up and take it down. Nice i like the setup. After I finish up Insanity I am going to hit the P90X. I have to adjust some moves, but its all good, I get a great workout in. For P90x what range of dumbells do you need? I see you have the adjustable ones, but they are pretty pricey right? I would definitely do P90X after finishing Insanity. Then do a hybrid version after that. This stuff keeps me so busy. Anyways, I use the Bowflex Selecttech 552 Dumbbells. They are a little pricey at around $400 but they have truly been a investment. They take up almost no space and with the twist of the dial you can go from 2 lbs to 55 in a second. It makes it easier to keep up with Tony Horton when doing P90X.